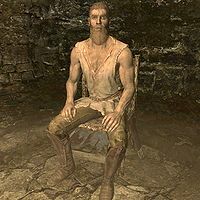 Salvianus is a retired soldier who fought in the Great War between the Thalmor and the Empire. He subsequently went mad and moved into The Ratway Warrens (below Riften). He spends his days sitting in his cell eating bread or sleeping on his mat. In his room, which he never leaves, is an Imperial Officer's Helmet, a randomly enchanted iron dagger, a leveled potion of Pickpocketing, and a leveled potion of Light Feet. He is one of the two inhabitants of the Warrens that do not turn hostile when entering their room. Esta página foi modificada pela última vez à(s) 23h27min de 2 de janeiro de 2014.